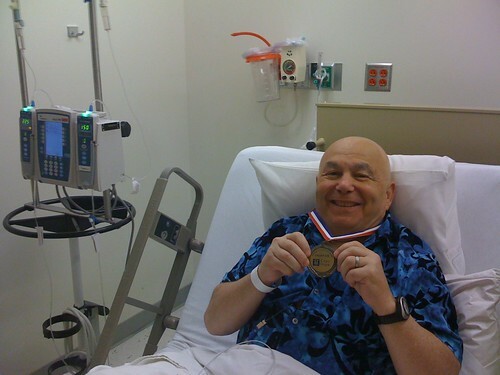 At the end of the day today, as the last of the chemo dripped into Chuck’s veins, all of the nurses in the infusion unit came into his room, sang Zippity-Doo-Dah and gave him a medal! We were doing pretty well keeping our emotions in check until they put that medal around his neck, then the tears started flowing. It was a great day mostly because it was the last day. But if you ever have cancer (and I sincerely hope you don’t), we can’t recommend the City of Hope highly enough. Those people rock. So proud of him and his widdle medal! I like that he’s kept with the theme of hawaiian shirts!